If your trees yielded a lot of lemons this year, don't let them go to waste. It is very easy to can lemons so that you can use them later. This is a guide about canning lemons. Lemon trees are a wonderful thing to have in your yard if you like lemon meringue pie. I particularly enjoy Ponderosa lemons. They are big and almost look like grapefruit except for little knobs at the ends. It only takes three to make that pie. However, you can use the regular little lemons we see in the stores all over the nation also. All citrus fruit is canned alike. If you don't have a lemon tree, you'll have to purchase your lemons. Once you have your fruit and your canning needs, it is time to wash your fruit. 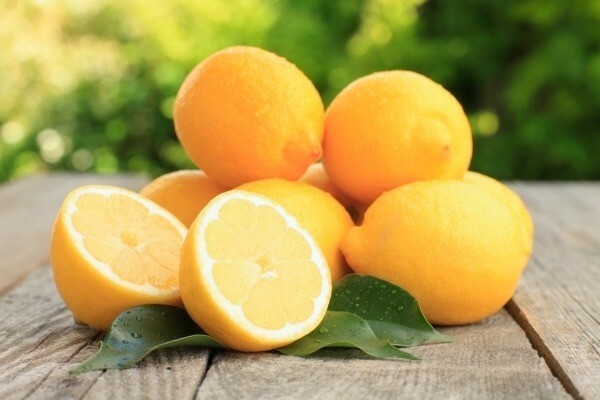 Lemons need to be washed in cool to lukewarm water. Dunk the lemons into boiling water for about a minute. The peel won't peel off like other fruit but it will loosen the white membrane from the fruit. I prefer to peel my fruit. Usually this is done with your hands but I save my fingernails with a citrus peeler. It is a small kitchen gadget looks like a crochet hook. Hook the peeler to the skin at the stem point of the lemon. Bring the peeler down the fruit with it cutting though the peel. Make four trails through the peeling like this. Take the flat end of the citrus peeler and use it like you would a fingernail. Place it under a point of skin and pull it away from the fruit. Get all the white off the fruit. It adds nothing to the fruit. With the fruit peeled, it needs to be pulled into segments. Using kitchen scissors, cut the middle white hard spot out of the segments. You can also take the seeds out if you want. To prepare the jars, they can be washed in a dishwasher if it has a sanitized cycle. The jars can be left in the dishwasher on a heat cycle. The lids need to be washed and left in the hot water. The canner needs to be filled so that there will be an inch of boiling water over the top of the jars. 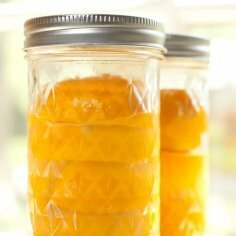 Most people canning use a very light syrup for citrus fruit. It helps keep the sweet taste but doesn't make the fruit heavy. Put the water in a saucepan and pour the sugar into the water slowly as it heats up. Bring it to boiling and boil a few minutes until sugar dissolves. While the syrup cooks, fill the jars with the fruit. Tap the jar on the counter a few times as you are filling it to help the air bubbles to break up. Fill the jar to 1/2 inch from the top. Carefully ladle or using the funnel pour syrup over the lemons. Fill the jar with the syrup so the lemons are covered and you have 1/4 to 1/2 inch headspace. Wipe off the jar top and add the hot lid. Screw on the band so it is snug but not so tightly you need three men and a small boy to get it off again. Place the jars in the boiling water of the canner. Use the jar grabber for this. Be sure the water covers the tops by at least an inch. Keep the water boiling throughout the processing. If the water is not covering the jars, add more boiling water. Process for 10 minutes. Once the processing is done, remove the jars from the canner. Carefully place them on a thick towel on the counter to cool. Keep the jars from touching. Once they cool, check the seal and you are done. Place them in a cool, dark place. Lemon trees are a wonderful thing to have in your yard if you like lemon meringue pie. I particularly enjoy Ponderosa lemons. They are big and almost look like grapefruit except for little knobs at the ends. It only takes three to make that pie. However, you can use the regular little lemons we see in the stores all over the nation also. All citrus fruit is canned alike. If you have never canned there are some things you probably need to buy for your kitchen. set with funnel, tongs, lid lifter, and headspace measure. You will also need about 6 cups of sugar and spoons and ladles. Find a big stockpot. I imagine you have some bowls and saucepans if you need them. If you don't have a lemon tree, you'll have to purchase your lemons. Once you have your fruit and your canning needs, it is time to wash your fruit. 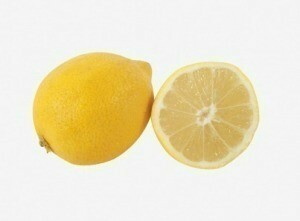 Lemons need to be washed in cool to lukewarm water. Let them dry as your go to the next step. I dunk my lemons into boiling water for about a minute. The peel won't peel off like other fruit but it will loosen the white membrane from the fruit. I peel my fruit. Usually this is done with your hands but I save my fingernails with a citrus peeler. It is considered a gadget in a kitchen store and looks like a crochet hook. Hook the peeler to the skin at the stem point of the lemon. Bring the peeler down the fruit with it cutting though the peel. Make four trails through the peeling like this. Take the flat end of the citrus peeler and use it like you would a fingernail. Place it under a point of skin and pull it away from the fruit. Get all the white off the fruit. It adds nothing to the fruit. With the fruit peeled, it needs to be pulled into segments. With the kitchen scissors, cut the middle white hard spot out of the segments. You can take the seeds out if you want at this point. Carefully ladle or using the funnel pour syrup over the lemons. Fill the jar with the syrup so the lemons are covered and you have ½ to 1/4 inch headspace. Place the jars in the boiling water of the canner. Use the jar grabber for this. Be sure the water covers the tops by at least an inch. Keep the water boiling throughout the processing. If the water is not covering the jars, add more boiling water. Process for 10 minutes. Once the processing is done, remove the jars from the canner. Carefully place them on a thick towel on the counter to cool. Keep the jars from touching. Once they cool, check the seal and you are done. Place them in a cool, dark place.